But seriously, is this really the LAST Jedi? I mean, really. As you well know, there’s a new Star Wars movie. Is it good? Yeah, it’s okay. Do a lot of people hate it? Yeah, a good number of people despise it. Does that make sense? It seems to depend on whether or not you are a super major Star Wars fanatic. For example, I am a fan of the original series (only the despecialized editions, though; I can’t stand the tweaks Lucas made), but my fandom ends there. I haven’t read any books, played any of the video games (except for that cool pod racer game on the N64), or otherwise interacted with the universe outside of watching the feature films. So, as a fan of the original trilogy but not a mega Star Wars fanatic, I thought the movie was fine. It’s not especially great, but it’s fine. On the other hand, my friends who are major devotees of the entire SW universe seem to be united in their dislike. They complain that the story could have been much better. They think Luke was mishandled. They think some of the elements are too political or just plain stupid. They think this doesn’t even feel like a Star Wars movie. To them, this is an outright travesty. Some even think it worse than the prequels. That seems over-the-top to me, but I guess it’s possible that, were I in their shoes, I would feel the same way. But I’m not, and I think it’s fine. Of course, I wish The Last Jedi didn’t exist, as I think the series should’ve ended with Return of the Jedi. But continue it has, and I think this is at least better than the prequels and The Force Awakens. 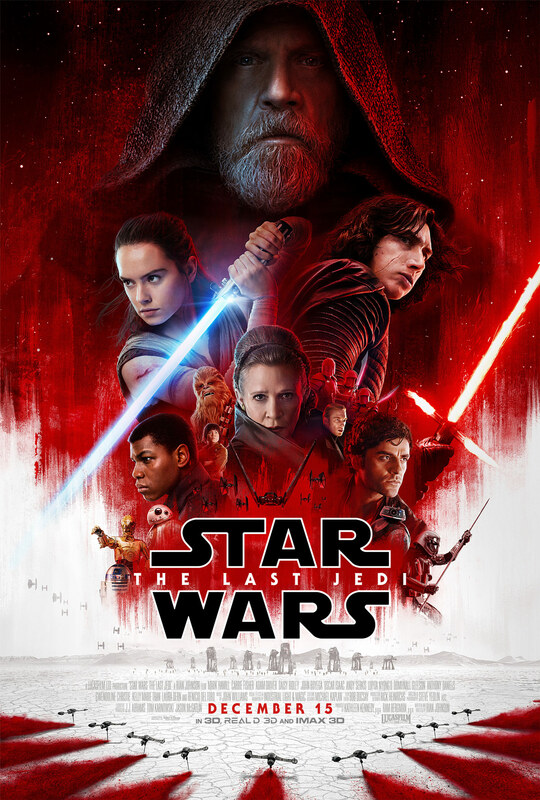 The real question is this: should you or should you not watch Star Wars: The Last Jedi? After seeing it with Brazle and Adam, my answer is: yes. Sure, there are weaknesses, but if you’ve made it this far, you might as well keep going. How’s that for a rousing recommendation?? IMPORTANT NOTE 1: The movie’s one unforgivable problem is the incorrect usage of “decimate” in the opening crawl. To decimate means to reduce something by 10%. The movie writers use it to mean destroy completely; obliterate (yes, that’s how it’s used in today’s vernacular, but that doesn’t make it right). Would that I could step onto a podium, step up to a lectern and deliver this message about correct word usage to the world. Even if I could only decimate incorrect word usage I would be happy. IMPORTANT NOTE 2: I must say that I really liked two things in particular: the acting and CGI. I thought Mark Hamill was effective as Old Luke, the guy who plays Poe Dameron was good, and it was great seeing Laura Dern. Regarding the CGI: of course, I think practical effects are nearly always better, but as CGI goes, this is phenomenal.